After a year that was primarily spent in the basement of the NHL, the Colorado Avalanche are turning a corner and are looking forward to bigger and better things. With the new look of the franchise, fans and players are energized and optimistic about what the season will bring. If the season is to bring greener pastures, then there are several players that are going to have to bounce back from disappointing seasons. Stefan Elliott burst onto the scene with the Avalanche a couple of seasons ago, making an immediate impact with his speed and quick wrist shot. Unfortunately, that success was a little short lived and he has gone back and forth between the NHL to the AHL ever since. Last season was incredibly frustrating for Elliott. He spent most of the year in Lake Erie and struggled greatly when he was called up to the Avalanche. He really just seemed to be fighting with himself while he was on the ice, which makes things incredibly difficult for a young player. The end result was him just looking lost and very frustrated on the ice. Elliott did begin to improve his play towards the end of the season, but things were already so far gone for the Avalanche as a whole by that point that it didn’t really matter. This will be a big year for Elliott where he will need to find his game again. If Elliott can do that, he could be a powerful weapon for the Avalanche. If he doesn’t, then Elliott may find himself in the AHL for much longer than he had hoped, or even traded to another team. Downie’s need to bounce back is not one that has to do with statistics as he didn’t really have any from a season ago. Downie has had some bad fortune after coming out completely on fire after the Avalanche acquired him at the trade deadline two seasons ago. He suffered a shoulder injury that required surgery at the end of the 2012 season and suffered a season ending knee injury in the first period of the second game of this past season. Downie has to be able to be healthy and on the ice in order to be an asset to this team, which he absolutely is when he is healthy and on his game. Downie has a solid game that covers all ends of the ice, can provide offense, provides energy and an agitation game that is a huge asset to his team. The Avalanche really need Downie to bounce back strong this season and give the team 82 very annoying and active games. Semyon Varlamov is so enigmatic at times that it makes me absolutely crazy. When he is on, there is not a player in the world he can’t stone, and he can ride that wave a long ways. The issue with Varlamov has been that, as brilliantly as he is able to play at times, he has stretches where he is equally bad. I will say this for Varlamov, there was a long stretch at the beginning of this last season where he was clearly the best player on the roster. He was shelled night in and night out, yet the Avalanche seemed to always at least have a chance to win the game. After a decent amount of that, his confidence seemed to get completely shot and his game ended up going with it. Like Stefan Elliott, Varlamov did begin to recover a good amount of his game towards the end of the year but, again, too little too late. Varlamov will have the added benefit of a much more regular goalie coach this season in Francois Allaire. Allaire is widely regarded as one of the best goalie coaches ever, so if there is somebody that can help Varlamov find consistency in his game and inside his own head, it will be Allaire. Even more importantly, Varlamov is coming into a contract season and really needs to give the Avalanche a good reason to keep him around after this year, as there are two young and very promising goaltenders behind him in Calvin Pickard and Sami Aittokallio. Erik Johnson is coming off of one of his worst season’s as a professional. Johnson did not have a single goal last season, struggled in his own end at times and had to deal with some injuries. Some of his struggles definitely had to do with the fact that the Avalanche defense was in such shambles a season ago and he clearly had to carry the rest of the defense. There were certainly a lot of times when it appeared that Johnson was trying to do everything by himself, which is really hard for any one player to do effectively in the NHL anymore. He was also woefully misused by Joe Sacco, which also hurt his cause. All of this a season after a lot of people thought that he might be named captain of the team. Johnson still has a lot of fantastic potential, and a new system will hopefully help all of the defense. Johnson is clearly the captain of the defense but he needs to play within himself and not try to do too much. Having a consistent partner is another thing that will help out Johnson, who has played with almost every other member of the defense since he arrived in Denver. I expect Johnson to have a big year this year. Paul Stastny is probably the most unintentionally divisive player on the roster. The only thing that he did was sign a contract that was offered to him, and ever since he’s been a marked man by a large portion of the fan base. Nonetheless, Stastny definitely needs to bounce back from the 2012-2013 season. True, Stastny did finish third on the team in scoring, again, but this is the only time where I feel that is a commentary on how bad the team was. Stastny had 24 points last season (9 goals and 15 assists) and was about 20 points behind the top two scorers on the team. Stastny also missed eight games last year, making this fact that much more saddening. Stastny has absolutely got to be better next season. 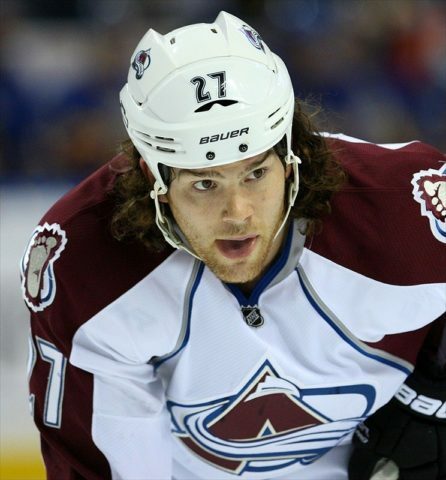 Again, a new system will hopefully help out, as will playing with a guy like Alex Tanguay. Tanguay is a superb set-up man and has a great shot in his own right, which should end up in more points for Stastny. Both of these guys together should also provide Gabriel Landeskog with a lot of easy finishes. This is also a contract year for Paul Stastny, which should give him a little bit of extra incentive to bounce back strong. If the Avalanche are going to bounce back, Paul Stastny is the player the team most needs to have a bounce back year.